A collection reflecting the unmistakable design style of Franco Poli. 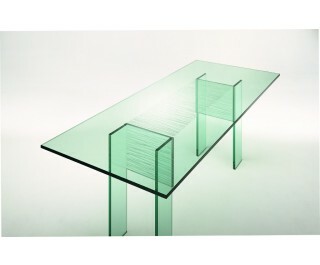 A large dining table where the development of the three Cartesian planes is underlined by special hand carving (a feature common to the entire collection), transparency and elegance in the formal simplicity of the thick plate crystal. The effect is continued in the coffee table, the cabinet and the side table, all unique pieces, hand carved one by one.